HUNDREDS of families are being asked to evacuate their homes, and an emergency services base has been set up at North Bundaberg with fears the suburb may become isolated. The Don Tallon Bridge remains open but Hinkler Avenue is cut before the Mt Perry Road roundabout. The Burnett Traffic Bridge will be closed at 6pm, with large areas of North Bundaberg expected to become cut off. 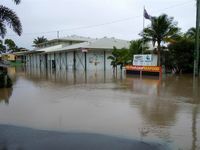 "The message to North Bundaberg residents is to evacuate early while you still can, before the bridge is closed," Bundaberg District Disaster Management Committee chairman Superintendent Rowan Bond said. 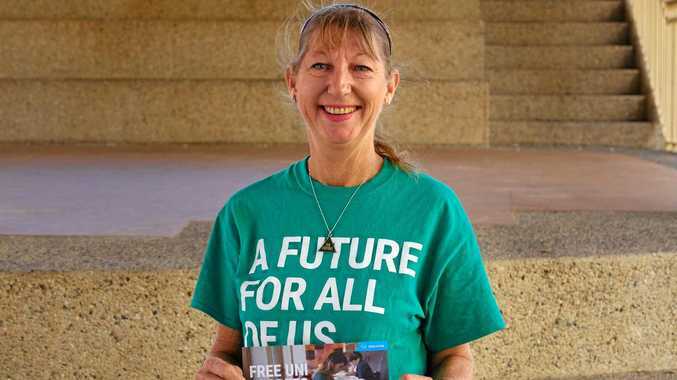 "We anticipate north and south Bundaberg will be isolated (by this evening)." He urged sight-seers to stay off the roads, and asked people to stay home unless travel was vital. "Sight-seers are putting a great deal of stress on the roads, so if you don't need to travel, don't go," Supt Bond said. "Walker Street is being encroached by water at Southside Central, so the situation on the roads is at critical point." Police, Fire and Rescue and Queensland Ambulance have set up a coordinated command facility at Hinkler House, Botanical Gardens, to provide emergency services when the area is isolated. 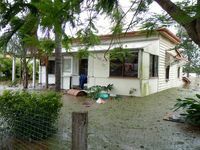 A Bundaberg Regional Council spokesperson said people should put plans in place to stay with family or friends who live on higher ground. Evacuees should stay with family or friends but if this is not possible an evacuation centre is being opened at the North Bundaberg State School for north Bundaberg residents. 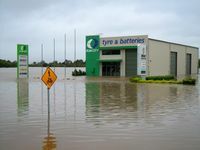 The Bundaberg Civic Centre has also been set up as an evacuation centre for others affected by the floods, with about 50 people already taking shelter there. People using the evacuation centres should take bedding and food supplies wherever possible. 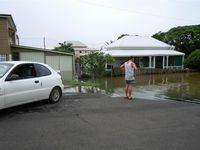 Sandy Hook is also cut off at Branyan Drive, with hundreds more residents cut off from Bundaberg. People are discouraged from travelling the Bruce Highway as it will be closed between Childers and Gin Gin until waters have receded, which could take several days. Relief centres in Childers and Gin Gin are experiencing high levels of demand and because of their size travellers will be turned around to either Maryborough or Gladstone. If assistance is needed call the SES on 132 500.